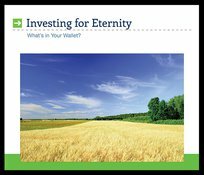 God's intention is for us to use our money for a high purpose: to make wise investments that survive our earthly journey. These messages are intended to help us understand what God thinks of money and how He uses it to test our loyalties. This is not a plea for giving, but rather a way to change our view of money so that we can invest in what really matters.